It looks like we jumped the gun in our praise of PlayTV, Sony’s forthcoming DVR add-on for the PlayStation 3. The feature we liked the best, the ability to transfer recordings onto the PlayStation Portable (PSP) or any device that supports MPEG2 playback, appears to have been dropped at the last minute. 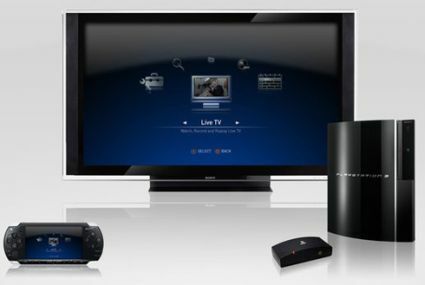 Instead, users are restricted to streaming live TV or recordings to a PSP over a local network or the Internet, SlingBox-style. And while this is still a neat feature in itself, it renders the device nearly useless for watching recordings on-the-go since the Remote Play functionality of the PSP requires Wi-Fi access. “With regards to PlayTV, you can not transfer content to your PSP, PC, or memory sticks” a Sony spokeswoman tells The Register. Why Sony has limited PlayTV to streaming only, the company isn’t saying. Although it’s likely more evidence of Sony’s content business overriding its technology business in a misguided effort to fight piracy. Whatever the reason, it’s sure to impact sales since it defeats one of the device’s major selling points. PlayTV will be launched in the UK on 19 September for £70 ($130/€87). Since when did Sony become 'pirate'-friendly?